Unusual Sardinian Dish ~ Sardinia Baby! So what is a Radio Telescope? "A radio telescope is a form of directional radio antenna used in radio astronomy. The same types of antennas are also used in tracking and collecting data from satellites and space probes. In their astronomical role they differ from optical telescopes in that they operate in the radio frequency portion of the electromagnetic spectrum where they can detect and collect data on radio sources". "astronomical telescope that picks up electromagnetic radiations in the radio-frequency range from extra-terrestrial sources". 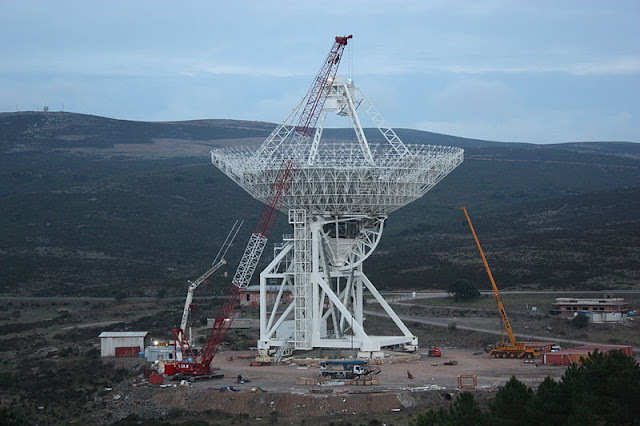 So it appears that The Sardinian Radio Telescope (or SRT as it's know) as well as being deployed for Radioastronomy, Geodynamics and other space-related matters it's also looking for Extra-Terrestrial life - Aliens!. The SRT is financed by the Autonomous Region of Sardinia and the Italian Space Agency. Its management is shared between Cagliari Observatory, the Institute of Radioastronomy in Bologna and the Arcetri Astrophysical Observatory in Florence. 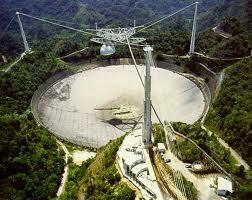 The largest Radio Telescope in the world is the Arecibo radio telescope located in Arecibo, Puerto Rico. It has a dish diameter of 305 meters! The ART was also featured in the Bond Film GoldenEye.